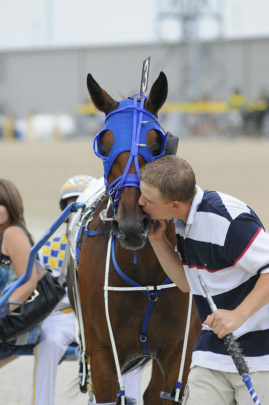 Locals love harness racing and we hope you will too. Come catch the action at this year’s newest series of races – Centre Wellington Derby Nights! A trio of Friday race nights at Grand River Raceway will celebrate our unique community, featuring a race named exclusively for Township of Centre Wellington residents and offering $1,000 in cash prizes. This summer, the residents of Centre Wellington will head to the track, bearing their postal codes with pride as they compete for $3,000 in prizes and bragging rights as the champions of Centre Wellington Derby NightsPresent your proof of residence at the Registration Table between 5:30 – 7:30. The track will host a trio of these events: June 29, July 27 and August 31. The feature race of each evening will be designated as the Centre Wellington Derby and the eight horses in the race will be randomly assigned to a postal code (N1M or N0B). The Centre Wellingtonians representing each postal code are registered for a draw following the race where 10 residents representing the winning horse will share a $1,000 cash prize. There is something about the sound of horse’s hooves thundering passed the rail, going at breakneck speed along the track, so gallant and strong, making the final turn running for position, with the yips from the drivers leaning back long in their sulkies, steering them into position. And all the while the animated commentary of the sportscaster keeps pace with the action, broadcasting from the speakers, his excitement booming out over the crowd so everyone is in the know for their win, place or show. Then there is the cheering, the energy of the crowd, the pure anticipation of the first horse to cross that post line. This is racing! Alive and in the moment. And there is no better place to experience it than Elora’s Grand River Raceway. We’ve never missed an Industry Day in Elora for good reason. It’s truly a summer highlight and one of the most fitting ways to cross the finish line of the August long weekend in a fun, relaxed atmosphere. We’ve been there in the rain and we’ve basked in the summer sun, but we’ve never left early, because there is something special about this day that can only be appreciated by being there. First off, It goes without saying that the signature races – Battle of Waterloo and Battle of the Belles – are incredible races and a true testament to the work, dedication and skill behind the standardbred racing industry. If you like horse-racing at all, or even if you’re new to the sport you’ll love the pomp and pageantry of these races. But the competition? Well, we’re placing bets two seriously close races this year and some records being set! There are some racing legends and family legacies we can’t wait to see compete. Admission is FREE. Where else can you have this much fun and be in on the action without paying a cover fee? Parking is FREE and there is lots of it. Some people even park in the back field, where the views are just as great. There’s room to move! You can bring the kids. There is plenty to do for the young and young-at-heart. Pony rides, a petting zoo, bouncy castle, face-painting and more is available with an all-access Kid’s Zone pass for just $5. The tarmac at Grand River Raceway is absolutely a family-friendly environment too. Everyone can get in on the action. (Please note: Children are not allowed in Elements Casino slots area). The Young Gunz miniature pony race is going to be hit this summer, because, who doesn’t love a miniature pony? You can go everywhere with free people-mover transportation making frequent stops throughout the event to get you to and from the parking lot, the back-stretch, the paddock building and to the tarmac for the home-stretch. This makes the raceway grounds accessible to explore. Without a doubt, one of our favourite highlights is the time-honoured Grand River Raceway tradition of the Halftime Show, featuring the Bouncy Pony Stakes – Drivers’ Edition. Don’t miss this. It’s a laugh a bounce. There are various places to enjoy food and a nice cold beverage, such as the 4 outdoor barbecues, 2 beer tents, the 3i n-house restaurants (though be advised, Captain’s Quarters is already booked), and a food truck. Interactive fun with the Tarmac Show, plus prizes and giveaways – always a good time. If you want to try your luck at the slots, you’re in the right place with Elements Casino. We’re betting you’ll have the best time, with 11 races on the card and the heart-pounding excitement of the Battle of Waterloo and the Battle of the Belles, the two signature races of the day, plus so much more. And don’t worry if you don’t much about harness-racing. The staff at Grand River Raceway make it easy and fun and there are no silly questions. The fun begins August 6 at noon, with Post Time for Race 1 set for 12:30pm. We’re betting you’ll have as much fun as we do at our favourite summer tradition – #IndustryDay28! Title Photo by NCJ Photography: Ideation Hanover with Jody Jamieson sets a new Canadian season’s record of 1:55 (2-year-old pacing fillies over a half-mile track) in the second of four Battle Of The Belles elimination races on July 30 at Grand River Raceway. Crowd photo and groom with horse photo by Dave Landry Photography. 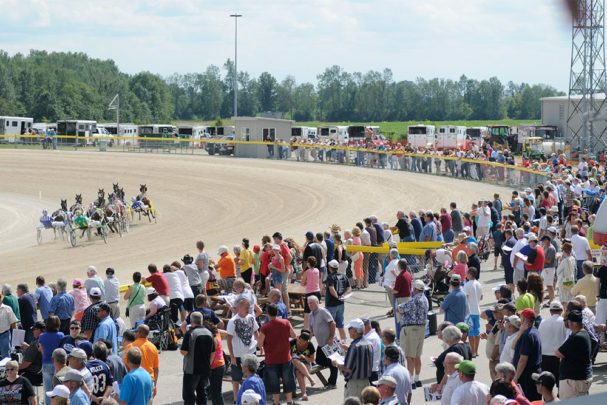 Expect an experience when the live harness racing season returns to Grand River Raceway – one of the BEST tracks in the province of Ontario on Friday, June 1. Then plan ahead for live racing on Monday, Wednesday and Friday nights all summer long! With a race card of between 10 to 12 races, free admission and free parking and lots of fun on the Tarmac Show, it’s fun for the whole family. And for those over 19th, the OLG Slots are on-site to make for a fun night. Enjoy the thrills, the sights and the sounds of live harness racing at Grand River Raceway!